You are here: Home / WordPress Tutorial For Beginners / How do I edit my profile picture, add some biographical information and reset my password? 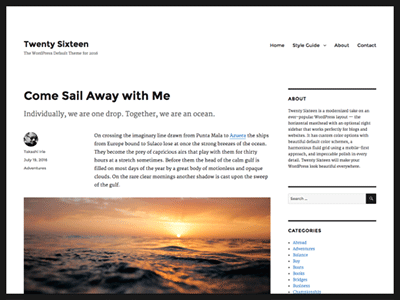 If you look to the left of any blog post on a site using the Twenty Sixteen theme you will see a small round image. This is a Gravatar image. 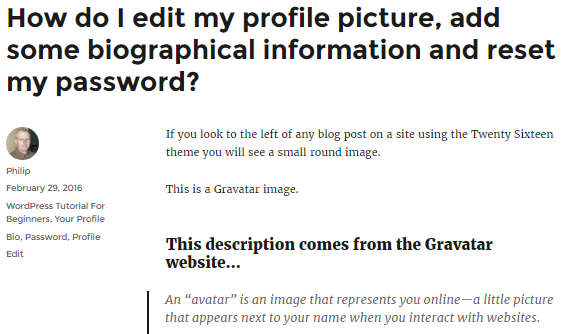 To make a Gravatar image appear in your site you need to set up an account on gravatar.com, luckily this is easy. In the WordPress Dashboard go to Users > Your Profile. Scroll down the your Profile page until you see the Profile Picture section. Click the link that says: You can change your profile picture on Gravatar. In the top toolbar click Help, then choose “How do I sign up for an account“. Set up a free WordPress.com account and follow the instructions to get your own Gravatar. Now, because you have set up your account at Gravatar.com. The email address you used to sign up for Gravatar is automatically connected with the Gravatar profile image you uploaded. Now whenever you use the email address connected to your Gravatar account. On any Gravatar enabled system. Such as your WordPress profile, or WordPress comments. Your Gravatar profile picture will automatically display. Below every post you write on your blog, you can display your profile photo and some information about yourself. There are two easy ways to reset the password for your website. and click the Lost your password? link. Users > Your Profile, scroll down to the New Password section. Click the Generate Password button. Make sure you remember this new password! Then click the Update Profile button. Previous Post: « How do I hide dialogue boxes I don’t need?